Quick and easy Pineapple Chutney recipe, perfect as a condiment with many Indian, Malay and Middle Eastern dishes. I also love using this chutney as a topping for canapés. If you can’t get hold of fresh pineapples, you can always use canned ones, preferably, with no sugar added, just in its own juices. 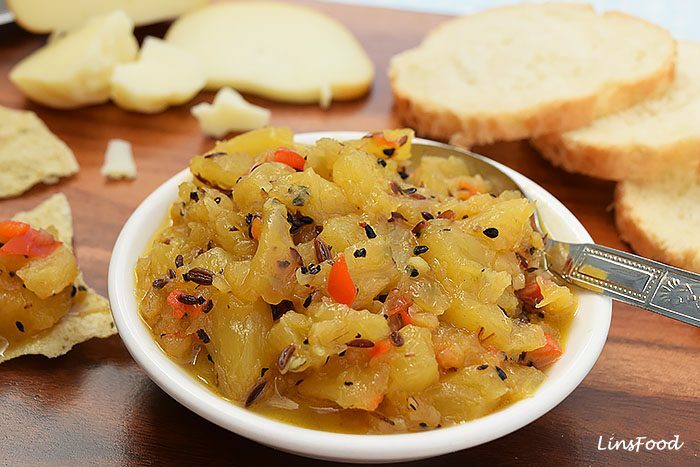 You can make this pineapple chutney as mild or as hot as you like, by using the right chilli. Slice the pineapple up into little pieces. Keep its juices. Heat the vegetable oil in a small saucepan on medium heat, and add the cumin, fennel, nigella seeds, cardamoms and black pepper. Fry for a minute until you get a lovely fragrant aroma. Add the ginger and chilli and fry for 30 seconds. Add the pineapple and its juices and stir to coat it with the spices. Add enough water to cover the pineapple and bring to a boil.Lower the heat right down and simmer for 15 - 20 minutes until the pineapple is soft and mushy and the water has reduced. Add the vinegar, salt and sugar and cook for 2 - 3 until it reaches a consistency that you are happy with, depending on how much liquid you would like. Transfer to a jar and keep in the fridge when cool. Will last for a week in the fridge.